Transforming Sri Lanka’s economy from a non-tradable focus to create more tradable goods is the basis of the economic restructuring targeted by the Government, Prime Minister Ranil Wickremesinghe said yesterday, calling on the private sector to become dynamic partners in the conversion. Wickremesinghe was speaking at the ceremony to award the ‘Most Admired Companies of Sri Lanka’ at Shangri-La, Colombo. The awards were organised in partnership with the International Chamber of Commerce, Sri Lanka (ICCSL) and the Chartered Institute of Management Accountants (CIMA) Sri Lanka. 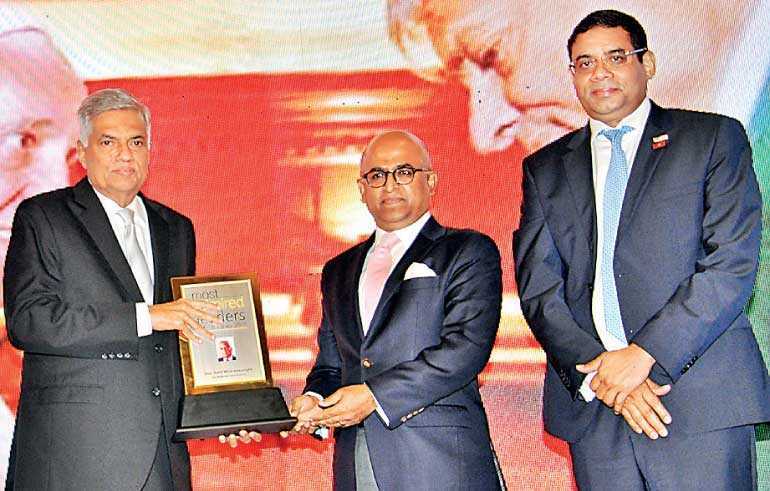 While congratulating the winners, Wickremesinghe pointed out that Sri Lanka’s economy was earlier driven by policies that promoted non-tradable sectors such as infrastructure development, resulting in tradable goods such as exports declining. The resulting debt could only be managed by promoting investment and exports to push growth through greater integration with global value chains. “It is certainly not the best of times as far as the global economy is concerned and it can become even more volatile in the future. Nevertheless, challenges have to be faced and what we are doing is restructuring our economy back to tradable goods. I would like to remind those present here that the merchandise exports of Sri Lanka as a percentage of GDP have declined from 33% in 2000 to 13% of GDP by 2017. That is the hard truth. Trade openness has also reduced from 77.4% to 37.14%,” he said. Even when Sri Lanka enjoyed growth rates of 8% in the years after the war concluded they were fuelled by growth in the non-tradable sector, mainly construction driven by public infrastructure. Since then growth has been subdued, usually falling between 4% and 4.5%, and impacted by weather challenges, he pointed out. “The investment activities that took place in the preceding period were not targeted to sectors that had the potential to sustain high economic growth, capacity expansion and productivity improvement. Exports only make up one-third of GDP growth. Foreign loans were largely channelled to infrastructure projects,” Wickremesinghe noted, adding that the Hambantota port, Mattala airport and the Norochcholai power plant created debt of Rs. 1.7 trillion. He said that about a quarter of the $ 12 billion debt Sri Lanka would have to pay over the next few years was comprised of foreign debt repayments. The Prime Minister acknowledged debt servicing remains a daunting task, especially given the appreciating dollar but outlined plans to give a boost to local companies by tinkering with tax policies that were introduced recently. Sri Lanka has to join the fourth industrial revolution taking place in other East Asian countries to become developed and escape hefty debt repayments. Wickremesinghe, borrowing a phrase from a previous speaker at the event who described successful companies as those being able to evolve to changing market lifecycles that have the lifespan of a fly while still having the staying power of a tortoise, as winners, quipped that he did not mind which animals local companies personified as long as they grew. A Trade Assistance Package, the draft of which has already been released to the public for feedback, would be part of government policy to assist companies to adapt as the economy continues to liberalise.